Babies and very young children in care often experience several changes of placement and carer, which can have a negative impact upon their long-term ability to develop secure attachments.Babies and Young Children in Care examines why babies enter care or accommodation and why securing their long-term future can be a lengthy process. It analyses the circumstances, characteristics and experiences o… f these young children before, during and after being looked after, including reasons for changes of carer and placement disruptions. It looks at how young children are affected by the lack of stability in their lives, and explores the consequences of reunification with their parents after long periods in care. 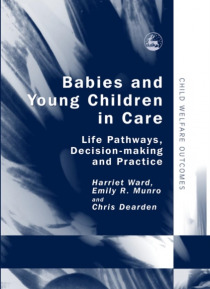 Drawing on interviews with birth parents, carers and social care professionals, the authors trace the complex decision-making process that influences these children's early experiences and the impact this has on their later development and well-being. They offer a clear explanation of the outcomes of services for very young children and signpost messages for practice.This book is a key text for researchers, practitioners, policy makers and social care managers.